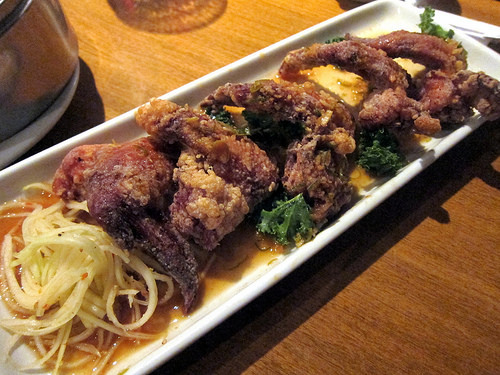 What if there was a restaurant that had almost all your favorite foods? And what if they specialized in Asian favorites? That would be Pingtung where a local fan described it as “Asian bestsellers.” Where else can you get relatively faithful renditions of green papaya salad, dim sum, ramen and yes, even shaved snow? I have to admit I was pretty suspicious of the menu. I selected the restaurant purely because it was convenient for our party of 4 to get to. We were coming from all directions and going mid-city was logical. We arrived early since they didn’t take reservations and it’s a good thing we did because pretty soon the place was packed. There was even a party limo that arrived and that giant party took over the back patio. We sat in the front room with the cutesy Asian products on the shelves. Pingtung also serves as a Pocky and other Asian snacks and condiments market. The owners are Chinese but have hired the appropriate chefs to spin out the various dishes. 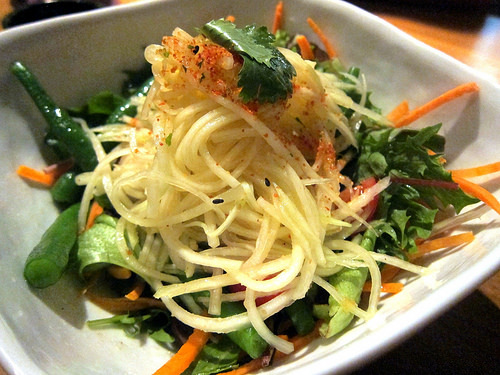 We started our meal with the light and crunchy green papaya salad. It wasn’t as spicy as some Thai places serve it but it was just fine with us since we had some spice wimps at our table– and yes, that includes me sometimes. I didn’t know what to expect when we got the crab dumplings but it turned out they were very good in their translucent wrappers and topped with roe. I could taste real crab in these beauties. 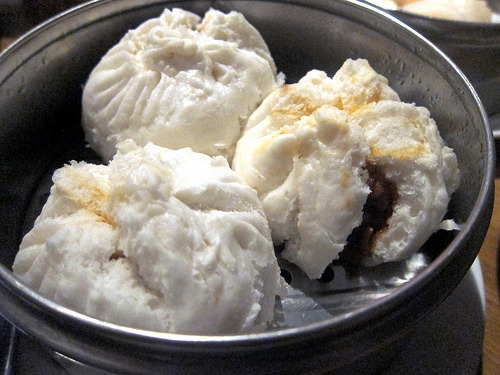 I’m not a fan of Chinese BBQ pork so I skipped the cha siu bao. Friends reported liking them. 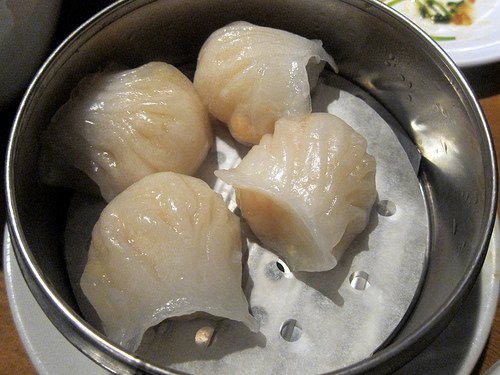 The crystal shrimp or har gow were faithfully rendered and if you asked me where these were from, I wouldn’t be surprised if someone said “San Gabriel Valley.” The wrappers were tender and the shrimp fairly fresh. 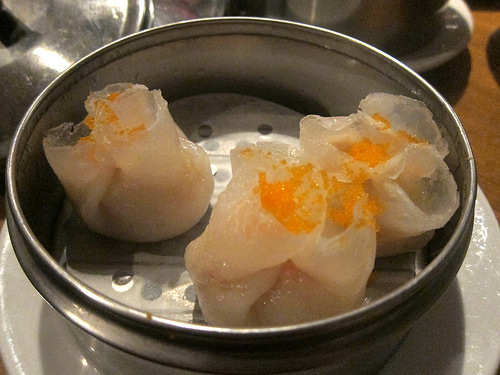 My surprise favorite were the three-mushroom dumplings. 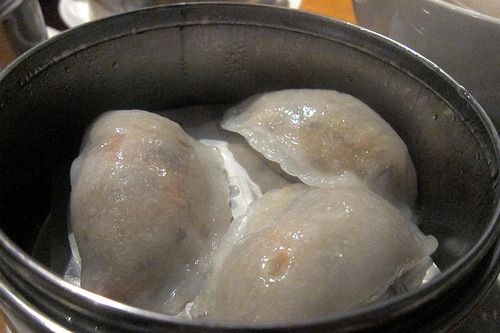 Vegetarians would love these “meaty” flavorful dumplings. 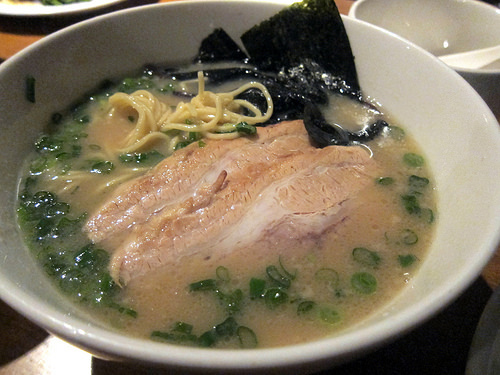 I couldn’t help myself and also ordered the tonkotsu ramen. Pingtung has a variety of ramen soups and I wanted to see how thick and fatty this tonkotsu could get. It’s no Daikokuya but it wasn’t bad. The noodles were very springy and you got a generous slab of pork. 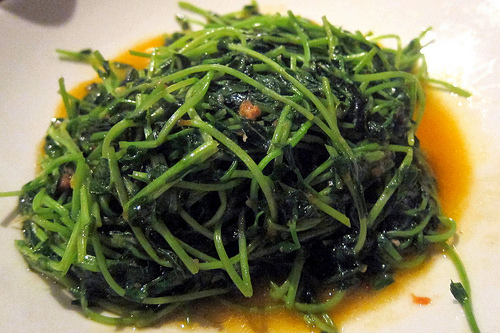 Moving on to more “dinner” dishes, we opted for sauteed pea sprouts and mabo tofu. The pea sprouts were a slightly smaller portion than I was used to so this dish went very quickly between four people. 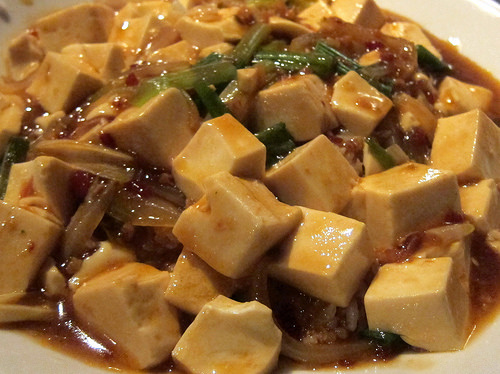 The mabo tofu wasn’t terribly spicy but the sauce was lovely and went well with steamed white rice. I would say the portion would be good for two people. In fact, you can treat basically all the food we had before as a hearty appetizer to the pea sprouts and mabo tofu. We had expected the chicken wings to come out at the beginning of the meal but we got them towards the end. I love fried chicken and it was worth the slight wait. 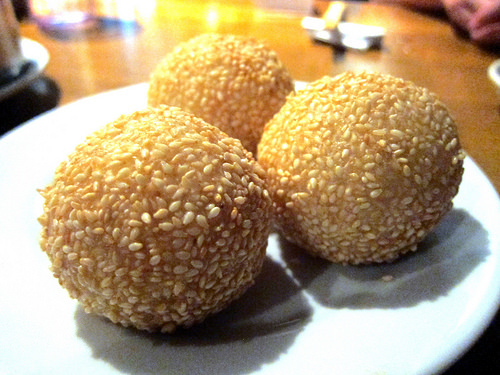 Under dessert, sesame balls were listed. We got those even though I felt they belonged during the dim sum portion of our evening. I thought these were quite wonderful. Nicely chewy and stuffed with the appropriate amount of red bean paste. One of the new hot Asian dessert trends is shaved snow. It’s a bit like taking a block of ice cream and shaving it into long ribbons. 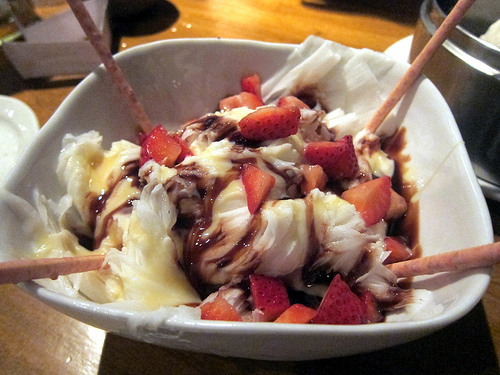 Decorated with chocolate sauce, strawberries and strawberry Pocky, this was a sweet, oh so sweet, end. Pingtung is next to the new Melrose Umbrella Company and I can’t wait to make this a two-fer stop.